A lovely set of the two volume American first edition, describing the remarkable journey through China in 1896-1897 by that intrepid lady traveller Isabella Bird, first female member of the Royal Geographical Society and doyenne of all women travel writers. A a far handsomer edition than the single volume published a year earlier in the London, with 116 illustrations and a folding colour map. ‘Many of the areas she explored and carefully described were almost unknown to European visitors and had not been mentioned in any earlier English publications. Based on journal letters and the diary written during her journey, and it is generously illustrated with photographs and Chinese drawings. Bishop's work was warmly received in England and praised especially for the information included on agriculture and industry. The Geographical Journal heralded the work as 'undoubtedly one of the most important contributions to English literature on that country'. It remains a key source for late nineteenth-century British perceptions of China.’ -– Cambridge University Press. The romantic account of Sonnica of Saguntum, and the eight month siege of her city by Hannibal which took place between 219 BC and 218 BC between the Carthaginians and the Saguntines. Text in French, illustrated with 60 colour etchings by Maurice Becque, and two monochrome portraits opening and closing the text. A limited edition of 270 of which this is number 176. Originally in wraps this copy has been placed in a smartly bound in half morocco and patterned end-papers. A scarce set of two near fine volumes. Entertaining early anecdotes together with a history, and Introduction to Ireland and The Irish. With titles such as Head-Breaking; Mrs. Fogarty’s Tea Party; Cads, Fools and Beggars; Ronayne’s Ghost; The Green Traveller; The Last Pigtail; Priests: Catholic and Others; Dublin Carmen; and An Irish Stew. In the original publisher’s gilt and green cloth, each with wood-engraved title-vignette. A lovely copy of this large, illustrated work on Edinburgh, with text by Bone based on his impressions and opinions of the city during a visit in 1910, and beautifully accompanied by Fletcher’s seventy-five drawings, including 16 tipped-in collotype plates and a lovely frontispiece etching depicting Edinburgh from Salisbury Craig. This copy also features an additional hand-signed etching by Fletcher, the same as frontispiece, bound in at the front. A lovely account of England’s waterways by historian and author A.G. Bradley, with descriptions of the Wye, the Severn, the rivers of Devon, and the Yorkshire Dales among others, and featuring 75 colour plates illustrated by Sutton Palmer, and with a fold-out map to the rear. A rather scarce first edition, first printing of the book, in first state dust jacket. Dee Brown’s powerful, eloquent, and meticulously documented account of the mistreatment and displacement suffered by native Americans at the hands of American expansionism during the nineteenth century. Brown used first-hand accounts of Dakota, Ute, Sioux, and Cheyenne tribe members, as well as autobiographies and council records, to narrate the battles, massacres, and broken treaties that left the native American people demoralised and decimated, dramatically changing the perspective of the history of the American West. Illustrated with forty-nine black-and-white photographs. 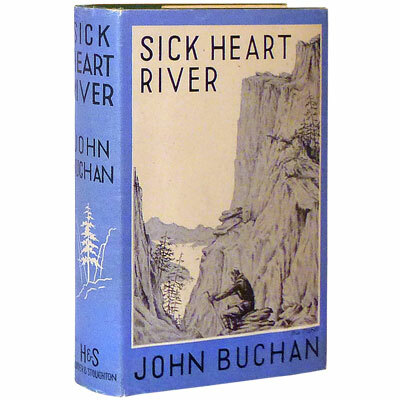 A fine first edition of Buchan’s last book, published posthumously. A fine first edition of Buchan’s last work of historical fiction, set in the Regency period, during the Napoleonic Wars. Set in the bleak Yorkshire hamlet of Hungrygrain, this is a stirring tale of treason and romance. Anthony Lammas, minister and Professor of Logic at St Andrews University finds himself entangled in a web of intrigue that threatens the country. His boyhood allegiance to a brotherhood of deep-sea fishermen involves him and his handsome ex-pupil with a beautiful but dangerous woman. ‘Crammed with the right ingredients : fishermen, hills, boats, hard-riding Scots, and intrigue in high aces’ – The Spectator, July 1934.